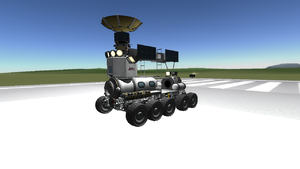 Crater Crawler is a large rover which can be controlled by intermediate players on Kerbin but excellent at maneuvering on low-G bodies like Mun and Minmus, but it also works on planets like Eeloo and most moons in the game. It has a unique design in that it has many levels as if it was a manoeuvrable lab with many experiments and data on-board. It also has a mini-probe that sits above the cockpit. “ While the Crater Crawler can be used on Kerbin if you're gentle, it really shines on a low G moon such as the Mun, where the built in thrusters allow an unparalleled level of manoeuvrability. 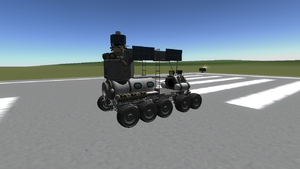 The craft is a heavy, 10-wheeled rover which is purposed for bodies with lower gravity. 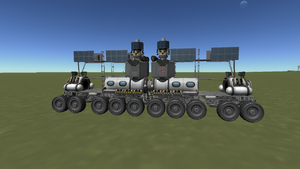 It has RCS for extra manoeuvrability when leaping from surface to air, It has docking ports to possibly dock with other Crater Crawlers, rovers, or potentially dock to a base on another world. It also has a little probe attached to the top of the rover which can be used to send to places rovers cannot go (i.e sinkholes) or possibly to get contact to other bases on the other side of the planet. However, the top level cannot be accessed by Kerbals on bodies with gravity higher than Duna as you can't climb out of the ladder and rcs functionality is useless on gravity higher than Duna. When docking with another Crater crawler, you'll have to align with their port and go at a reasonable 5m/s to dock as the RCS will block the ports from meeting at slower speeds. When 2 of them are docked, they are difficult to manoeuvre as they will slide across the surface as the docking ports are very stiff. Adding more to the ends will make it more difficult and will need more precision with turning. It isn't possible to dock the back ends as the RCS ports prevent them from docking. This page was last edited on 9 January 2019, at 19:04.